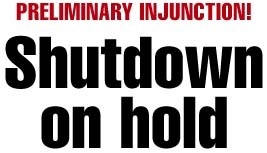 Federal Judge Alan Kay today granted a preliminary injunction effectively halting plans to shut down the Honolulu Star-Bulletin, at least for now. Kay rejected arguments by Gannett Pacific Corp. that First Amendment rights were affected. The judge said Liberty made no effort to try to sell the Star-Bulletin before entering the termination agreement with Gannett, and he said more than 100 jobs would be lost. Once the newspaper is closed, the judge said, it would be impossible to start it up again. Gannett asked the court to issue a $10 million bond to cover the amount Gannett says the Star-Bulletin is losing annually. Kay issued a $10,000 bond. Kay described his decision as a "difficult one." His ruling on the injunction can be appealed to the 9th U.S. Circuit Court of Appeals. Arguing before Kay this morning, Rodney Kimura, deputy attorney general, said Star-Bulletin owner Liberty Newspapers and Advertiser owner Gannett Pacific Corp. conspired to monopolize general circulation newspapers on Oahu by agreeing to end the Joint Operating Agreement and that the balance of hardship tips in favor of the state. Readers will be deprived of a separate editorial and news voice and the state will lose an institution that's been operating for 117 years, Kimura said. There will be irreparable loss, he said. "Today we ask Liberty to put the Star-Bulletin up for sale and be restored as a going concern rather than as a cadaver," Kimura said. In response, Bob Bernius, attorney for Gannett Pacific Corp., repeatedly said "the Star-Bulletin is losing money" and that is why Liberty chose to terminate the JOA. He said Liberty was dissatisfied with its investment and that there is no law that forces the two newspapers to continue to lose money. Agency, walk into Federal Court this moring. Attorneys for both sides had agreed to argue on both the attorney general's motion for a temporary restraining order and the next step, a preliminary injunction -- saying the arguments are the same. The state attorney general on Friday filed a request for a restraining order to preserve the newspaper's operations and prevent further erosion until the court can consider the merits of the state's lawsuit challenging the termination agreement between Liberty Newspapers and Gannett. The courtroom was filled today as proceedings got under way. In attendance besides the principals in the state's case were representatives from the citizens group Save Our Star-Bulletin, legal observers, concerned citizens and some Star-Bulletin employees. with the U.S. Department of Justice's antitrust investigation. HNA has until tomorrow to produce all requested documents. While newspapers do have a constitutional right to publish or not to publish as Gannett argued in court documents, "the First Amendment does not sanitize everything a newspaper does," said Kimura. The First Amendment does not immunize the repression of views, and the defendants are restraining views and trade by refusing to publish, Kimura said. "Liberty is being paid to cease publishing. That's what's wrong," he said. The importance of terminating the JOA and the partnership with HNA is that Liberty will have no means of publishing the Star-Bulletin because HNA and Gannett are not obligated to perform the business function that they do now, Kimura said. The clear intent of the $26 million agreement between Gannett and Liberty to end the HNA partnership is to shut down the Star-Bulletin and eliminate it as a competitor to the Advertiser, he said. Kimura said actions taken by HNA, including switching subscriber and advertising accounts for the Advertiser and removing Star-Bulletin street vending racks, virtually assures there will be nothing left of the Star-Bulletin. The danger of irreparable loss is immediate once the Star-Bulletin closes, he said, and it's highly unlikely it will reopen. 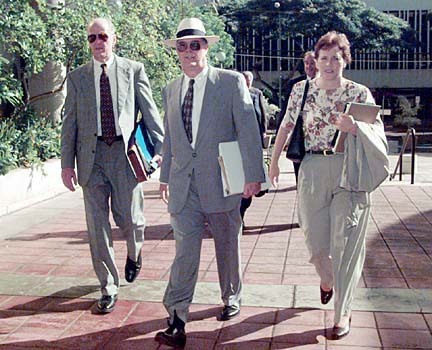 Bernius repeatedly said there's nothing in the newspaper act that requires papers to be open for a minimum term and nothing that prohibits the termination of a joint operating agreement. He discounted the state's request for an injunction, saying the courts have no right to order newspapers to compete editorially. "The purpose of the Newspaper Preservation Act is to preserve independent voices," Bernius said. "However, not voices that express themselves under a court order or state operation." He added that the courts cannot force the newspaper to publish when it doesn't want to because it would impose undue costs on the publisher. The Gannett attorney also said the court cannot micromanage a newspaper to include its distribution system, referring to the argument about the newspaper racks. Alan Marx, Liberty's attorney, said Liberty has the right to decide whether it wants to publish a newspaper and he wasn't aware that there were any buyers interested in the Star-Bulletin. Gannett contended that a restraining order forcing the Star-Bulletin to continue would be unconstitutional and would cause financial harm. Gannett also argued there is no agreement between it and Liberty to shut down the afternoon newspaper or to have anyone stop competing. "The parties have agreed simply to abandon their joint business operations and to terminate the JOA (Joint Operating Agreement) on Oct. 30," Gannett said in its memo of opposition. After the JOA ends, Liberty Newspapers can choose to publish or not publish the Star-Bulletin, Gannett said. 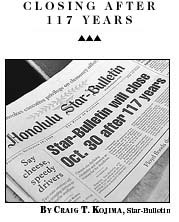 The state argued that closing the Star-Bulletin is a violation of federal and Hawaii antitrust laws because the agreement ceases publication for a payment to stop competing. A similar lawsuit was filed by seven private citizens working with the unions that represent most of the approximately 150 people who will lose their jobs when the newspaper stops publishing. Last month, Liberty newspapers announced plans to end the Star-Bulletin's 117-year run on Oct. 30. "Gannett is neither buying up nor closing assets to prevent others from using them," Gannett argued. "HNA (the Hawaii Newspaper Agency) is returning the Star-Bulletin's assets to Liberty, who is free to use them to compete." Rather than restricting competition, ending the JOA would increase it, Gannett said. The Star-Bulletin and the Advertiser can then compete on all business matters. If Liberty chooses not to continue publishing, other competing newspapers will be able to enter the market. Under the JOA, Gannett controls all production, circulation and advertising functions, including setting ad rates, prices and promotions through HNA. Terminating the JOA would not harm competition because any economic competition between the Star-Bulletin and Advertiser ended when the JOA was formed more than 37 years ago, Gannett argued. Kimura said the preliminary injunction basically seeks to stop the defendants from "tampering" with the Honolulu Star-Bulletin because there might not be any assets remaining when the state takes the next step in its lawsuit. Stopping the removal of Star-Bulletin street vending racks unless required by the city or state and continuing to stock them. Prohibiting subscription/circulation operators from notifying subscribers that the Star-Bulletin is shutting down and continue selling advertising space and subscriptions to the Star-Bulletin. Refraining from actions that may affect the business or financial condition of the assets of the Star-Bulletin. Giving 60 days' notice if Liberty Newspapers decides to stop publishing so the court has time to provide appropriate relief. Leaving the staff of the Star-Bulletin intact, except for filling vacancies or removing them for cause. 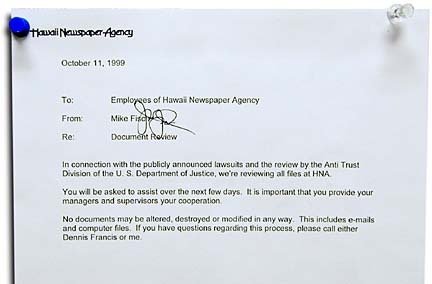 Maintaining separate financial and operating records for the Star-Bulletin, Advertiser and Hawaii Newspaper Agency and produce financial statements. Continuing to abide by the terms of the Jan. 30, 1993, Joint Operating Agreement.